Description: 2014 GRAMMY Award Winner - Best Jazz Instrumental Album!! 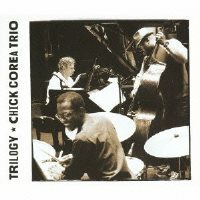 Legendary jazz pianist Chick Corea has been releasing new recordings constantly, but it took the Japanese label responding to the taste of the Japanese jazz fans to release one of his most important all-acoustic, straight-ahead jazz outputs in recent years. The 3-CD Trilogy, which includes over 200 minutes of music, contains the best recordings of the world tour of his supertrio with Christian McBride and Brian Blade which took place in 2010 and 2012. The materials include standards, Corea's and other jazz musicians' original compositions, and even a classical composition by Alexander Scriabin. Corea's own "Piano Sonata: The Moon" is also included. As guest artists, Jorge Pardo on flute and Nino Josele on acoustic guitar join the trio on two tracks which were recorded in Madrid, Spain. Gayle Moran Corea appears on the last track of Disc 3. Corea's performance is brilliant throughout, and the interplay between the three masters and geniuses is simply breathtaking. Recorded and mixed by Corea's trusted long-time engineer Bernie Kirsh at 24 bit/96 kHz and mastered by Bernie Grundman, the sound quality of these exciting live performances is also exceptional. This Japan-only 3-CD set is pressed on SHM-CD (Super High Material CD) which uses a special high-quality polycarbonate material for improved sound. Easily one of the best ten jazz CDs released in 2013! Very highly recommended to fans of mainstream jazz, and a must-have item for fans of Chick Corea! Recorded live in concerts in the U.S., Spain, Turkey, Austria, Switzerland, Slovenia, and Japan in 2010 and 2012. SHM-CD is compatible with all CD players.